Check out and subscribe to Many Roütes – a Seed Podcast to hear more about this trip. Originally posted on Medium. 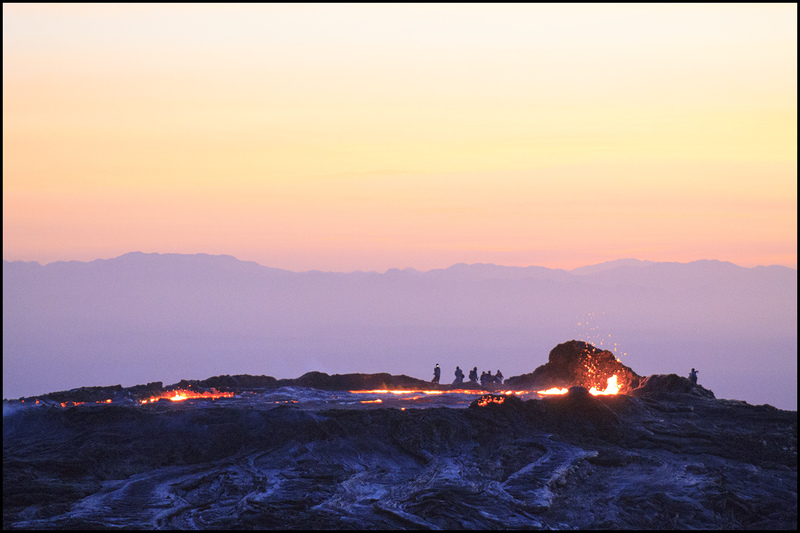 With the evening sun setting ahead of us, Cara and I began the hike to the volcano, which would take most of the night. The base camp we left behind was filled with the trash of previous trekkers and circular huts made from igneous rocks. The last rays of the daylight cut through the joints and voids in the stones. 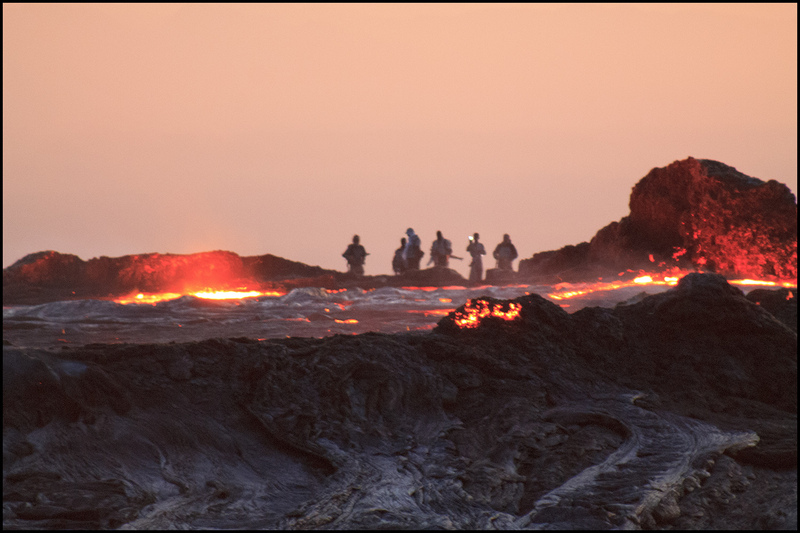 In front of us, brown sand and scrub gave way to a wide, basalt plain that absorbed color even from the sky itself so that the landscape wasn’t so much black as just devoid of pigment. If Cara hadn’t been to Bayan Olgii, it would be tempting to describe the scene as lunar. However, Cara’s photos of Mongolia’s westernmost province showed barren scree and scenes where life and land were two unrelated concepts, while this part of Ethiopia’s northeastern badlands looked as if the land was able to swallow life itself and trap it just below the surface, pushing up against the underside, desperate to get out. We started off trailing close behind camels that would carry our gear to the summit camp on the rim of Erta Ale’s crater. Their steady pace and sure feet never faltered even as the path steepened and the sky darkened. Each time we paused to try to catch both a glimpse of the end as well as our breath, the camels, as unconcerned with us as the sharp rocks beneath their padded feet, lumbered further ahead until the only evidence they existed were fresh piles of dung, which we pointed out to each other to avoid stepping in. 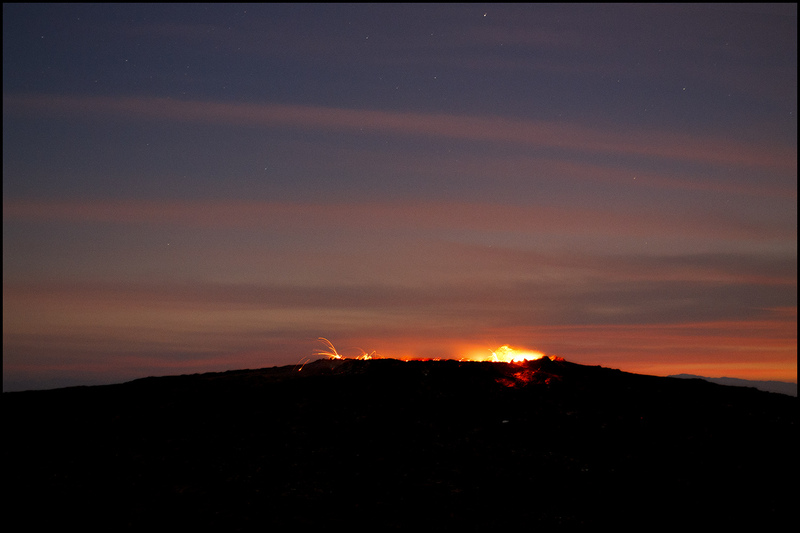 An hour or two into the hike the sun set and we scoured the darkening horizon for the glow of lava or some other hint of Erta Ale. 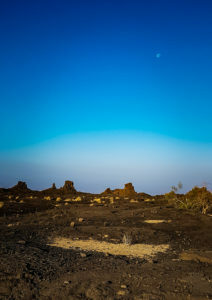 As the landscape blackened, a moon waxing full climbed above the Danakil depression, providing a bone white contrast to the badlands below but no clues and insufficient light. Weeks later, we would learn of two events, one before this hike and one after, that would change our memories of the experience like two hands pulling a slack wire taut. First, the very camp along the rim of the crater that we were making our way to was the same place where tourists and scientists had been killed in 2012. 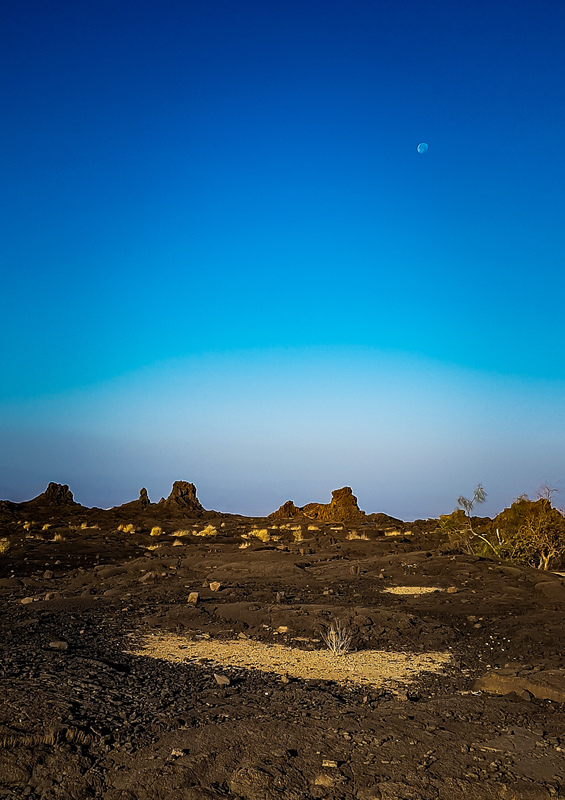 The volcanic range we were hiking was within sight of the Eritrean border, which is still a tense area. Ethiopians in Addis Ababa casually relay that it’s common knowledge that in Afar and Tigray, the border regions, every shop owner has a gun and so do most of the individuals browsing the stores. 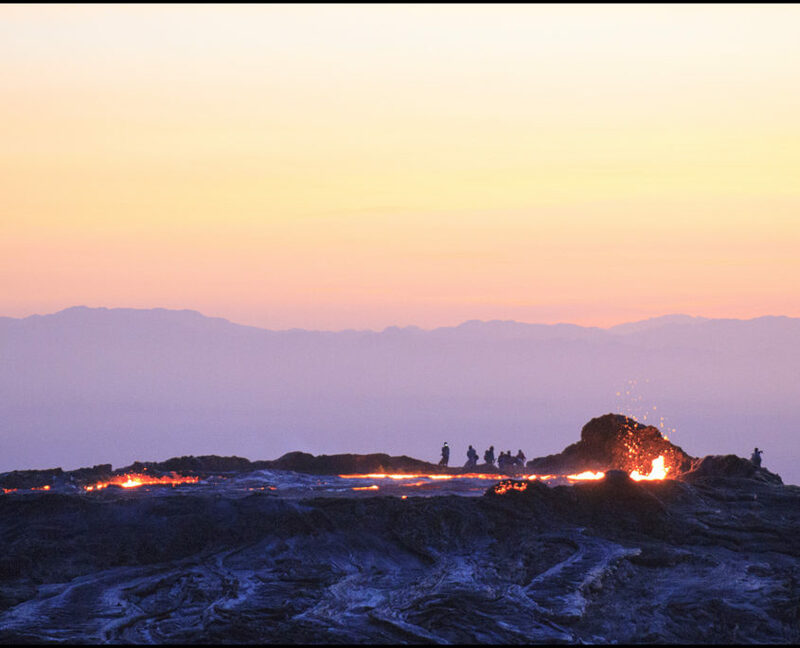 Second, excursions scheduled for the week after were not able to make camp at the rim of the crater like we would that night. An eruption shortly after we left and fresh lava flow meant we would be the last group sleeping so close to the lake of fire for a while. We hiked long after the sun set with a red and yellow promise. Shadows peaked out from between the fissures in the ground. The moon rose and the gloom retreated but did not surrender. Shadows pushed back from stony strongholds. Flashlights lit up narrow sections of the path and the shadows firmed up on either side. Blisters formed beneath the leather of hiking shoes inadequately worn in. Batteries gave out and were replaced. Blisters broke. And finally, ahead and above us, a red glow strengthened. 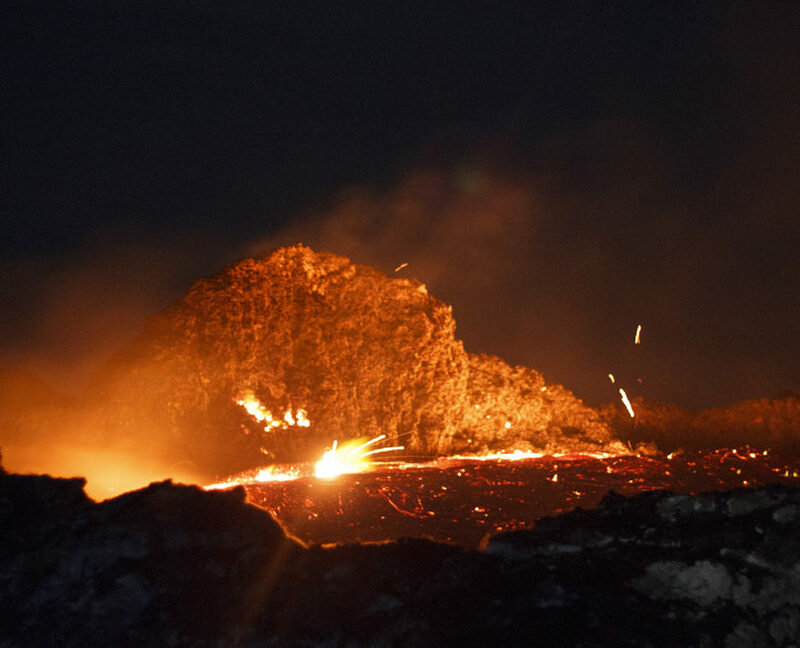 Some time past midnight and completely exhausted, we looked down from the edge of Erta Ale’s caldera and into a seething lake of fire that sparked and sputtered. 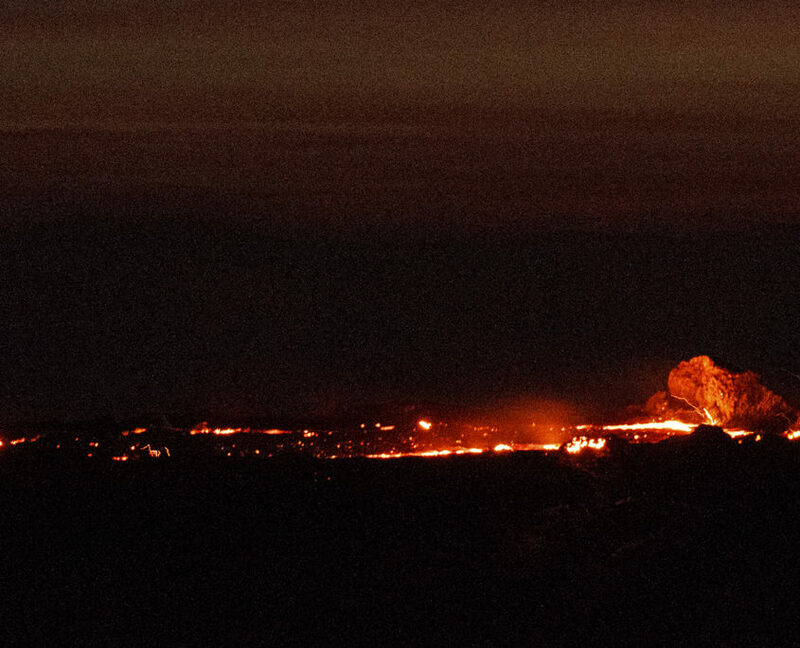 Even from a distance, we watched glowing lava lazily splash into the sky. My legs buckled. 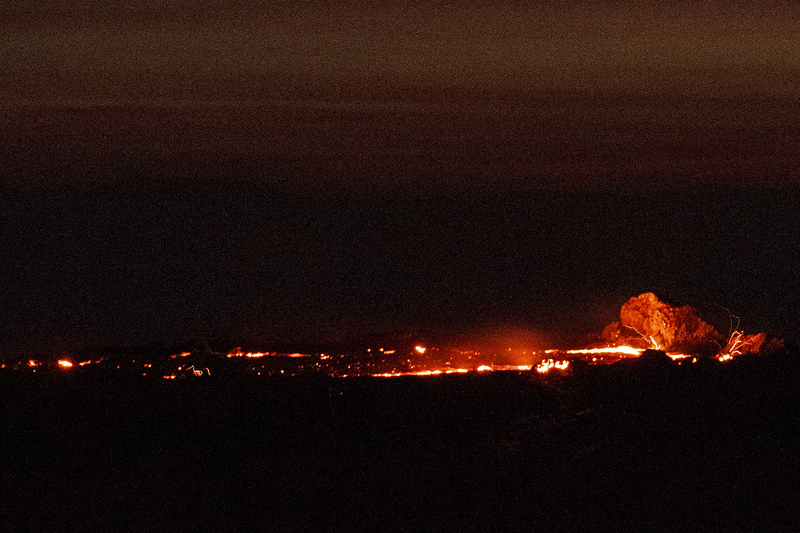 I didn’t fear the fire so much as the steps cut into the rim of the crater. 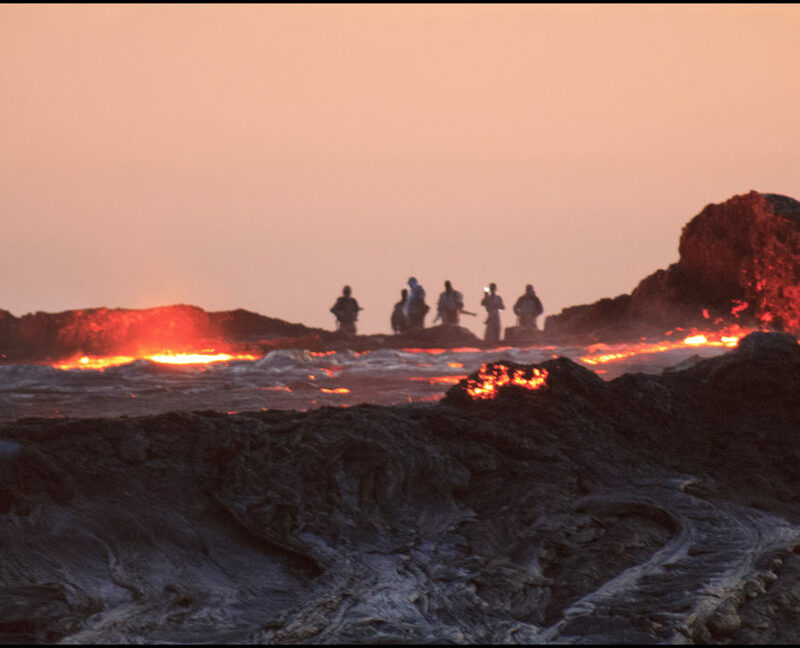 They went straight down, cutting back every few feet and led to still another trek, albeit short, this time across a smoking bed of hardened lava. 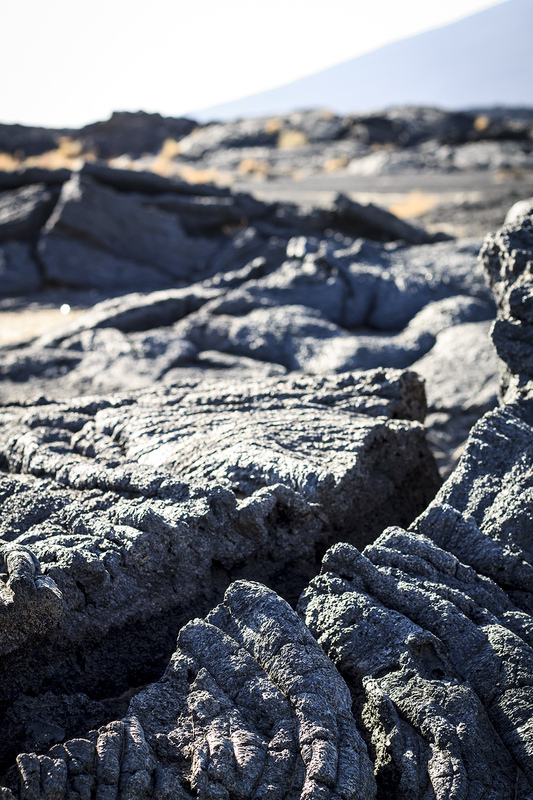 I gave myself good odds of being able to get down the steps, slightly worse odds of making it across the lava field without collapsing, and significantly worse odds of climbing the stairs back up to the camp. However, it was a risk worth taking. 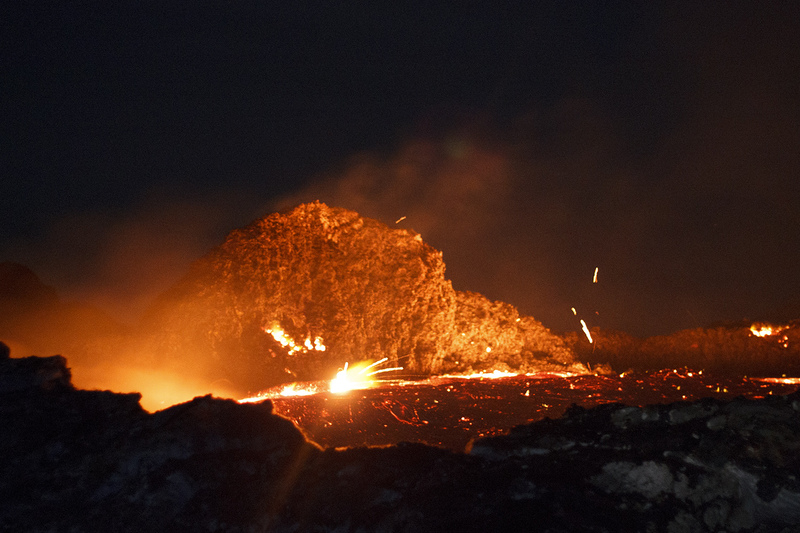 How do you sleep next to a lake of fire? After a hike like this, soundly.